Home > MWC > LG releases teaser of the G2 Mini ahead of Mobile World Congress. What’s with all the pink though? 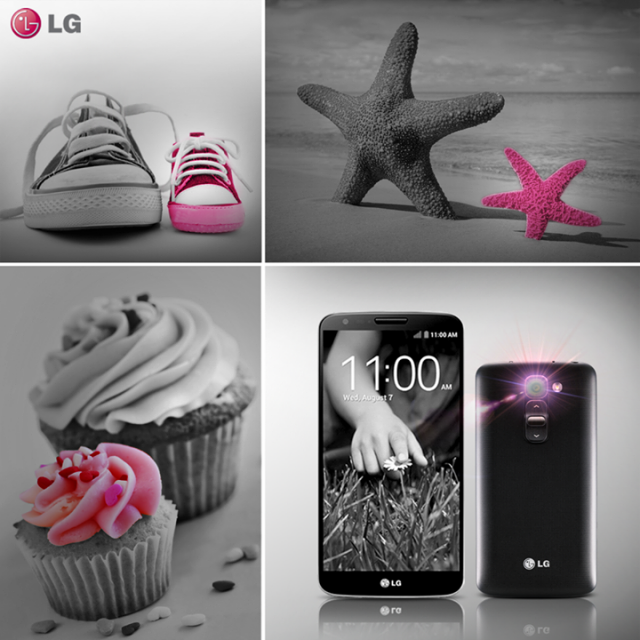 Following their big announcement of the LG G Pro 2 yesterday, the company are now anticipating another big launch at the Mobile World Congress which is commencing from February 24th in Barcelona, Spain. This time around the company are focusing on the younger variant of its successful LG G2, which for now is assumed to be the LG G2 Mini. Even though there has been no official wording on this regard, we manged to come across a picture that was uploaded on LG’s official Facebook page having a “Mini” Caption along with details regarding the MWC. The phone does look quite sleek in the picture but the one thing that has left us scratching our heads is to exactly why so much Pink is involved? Well we’ll soon find out once the device gets officially announced in a few days. Stick around for more rumors and announcements as we head closer and closer to the mega mobile event.